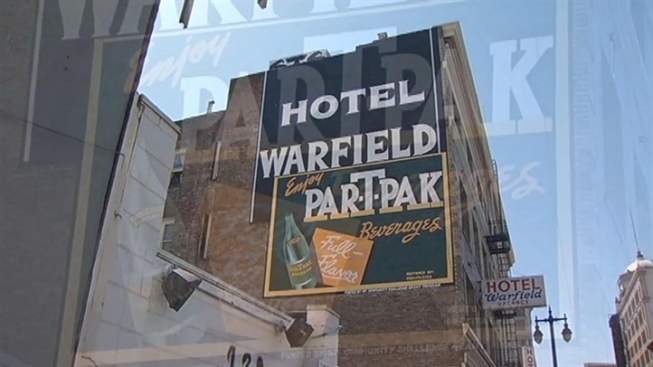 Artists restore vintage wall advertisements in San Francisco's Tenderloin. If you look beyond the grittiness of San Francisco’s Tenderloin, you’ll find ample evidence of its glory days. Its streets are lined with apartment buildings and hotels dating back as far as 1907. It seems the neighborhood’s rough reputation scared off progress and developers, leaving an architectural gem in an urban time capsule. Tucked into many of the neighborhood’s alleys, are crumbling brick walls bearing an assortment of vintage advertising murals. They peddle everything from 7-UP, to the services of a watchmaker, to a long-extinct beer. A $41,000 city grant is helping bring those old advertisements back to life. For the last few months, artists with Precita Eyes Muralists have been delicately restoring the murals to their past glory. Fortunately, Cervantes put a bit more care into his restoration of the murals than the original artists. He and his team restored five of the vintage advertisements near the corner of Taylor and Eddy. Above a parking lot near the former Original Joe’s, a colorful restored ad for the Hotel Warfield hovers above an ad for Part-T-Pak sodas. Though an incarnation of the hotel still remains, the sodas haven’t been available for decades. “It definitely beautifies the area and brings back some of that history that’s been around,” said Cervantes looking up at the mural. The artists had to peel away over a hundred pounds of old paint to determine the original color scheme. Layers upon layers of paint revealed the sediment of decade’s worth of previous ads. Around the corner, a partial Coca Cola sign was also restored. It sat next to another sign advertising a telegraph school. Shaw has been a champion for restoring and reviving the Tenderloin’s history. He oversaw the placement of informational plaques outside the neighborhood’s historic buildings. He said restoring the area’s vintage advertising bring a splash of color to the colorful neighborhood. “The whole goal is to be able to show people this is a historic district and it’s a place they should walk around, eat in the restaurants and it’s a good place to hang out in,” Shaw said. Shaw also revealed plans to place sidewalk plaques outside the locations of historic spots – like the site of the former Blackhawk Nightclub where Miles Davis recorded his famous album. “There’s no other neighborhood you can think of, of this size in San Francisco that is this much in-tact,” he said. Shaw thinks of the Tenderloin as a place prosperity and development skipped over -- leaving behind a neighborhood where the idea of ‘living in the past,’ is a compliment.